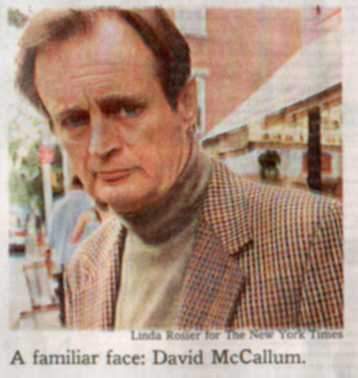 A s paranoid as it sounds, David McCallum is absolutely certain he is being shadowed by a Russian agent. "He's there every day," McCallum said in a stage whisper as he peered over a pair of sunglasses. "I mean, it's been 30 years, but I can't escape him. Illya Kuryakin is there 24 hours a day." McCallum's suspicions may be correct. For nearly 50 years, he has been an almost constant presence in television, film and onstage, a lifelong character actor whose career ranges from Ibsen to B-movies and who has played parts from Judas Iscariot in the biblical epic "The Greatest Story Ever Told" to a kindly uncle in the upcoming independent film "Cherry." But the role for which most fans remember him is that of Kuryakin, the brooding, mysterious Russian operative in the 1960s joke-and-dagger spy series "The Man From U.N.C.L.E." "The whole idea was that you knew nothing about him: gay or straight or married, who knew?" McCallum, now 64, said. "I suppose it was effective." McCallum's current assignment is playing Harold Palmer, the befuddled security guard in Alan Ayckbourn's comedy "Communicating Doors" at the Variety Arts Theater. The play is McCallum's second in a New York theater this year after an absence of nearly a decade; in May he appeared in a revival of "Nasty Little Secrets" at Primary Stages. For an actor whose reputation is so tied to a role he played long ago, it comes as no small amusement to McCallum that the primary device of "Communicating Doors" is time travel, with characters jumping back and forth in 20-year intervals. "I really fell in love with Harold, because to an extent, he's the only character that doesn't change at all," McCallum said, explaining his method for conveying the character's aging: "It's really stomach in, stomach out. Acting by midriff." As has often been the case in his career, McCallum has received positive reviews despite critics' generally mixed feelings about the production. 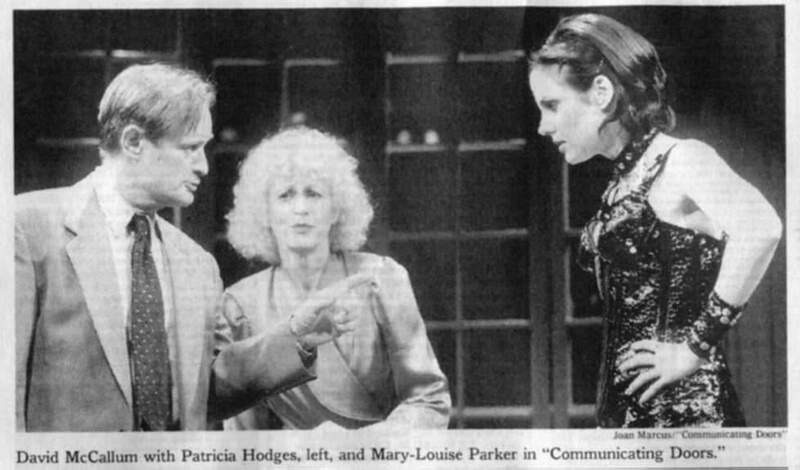 Of McCallum's performance in "Communicating Doors," Peter Marks wrote in The New York Times: "You find yourself wishing that he could have played all the male parts." McCallum's ability to stand out has served him well in a career spiced with B-movie credits like "Frankenstein: The True Story," "The Screaming Skull" and something called "The Haunting of Morella." Still, barely a review goes by that doesn't mention his former life as a secret agent. "When I just put the last couple of years in my theater bio, people object and think I'm hiding him, hiding Illya," he said with a note of wonder. "It's not that at all. I'm not listing stuff from three decades ago. I mean, there's limited space." His current biography does not refer to the show, but that hasn't fooled audiences. On opening night, at least one older fan showed up clutching an Illya Kuryakin T-shirt. "I had never seen the show, so I wasn't prepared for the phenomenon," said Mary Louise Parker, McCallum's co-star in the play. "He's this quiet, thoughtful, sweet man with this perfect air of refinement. But when he comes onstage, the ladies in the front row literally start to swoon." A native Scotsman, McCallum trained as a teen-ager after World War II at the Royal Academy of Dramatic Arts in London before being drafted into the British Army and serving in West Africa in the Gold Coast, now part of Ghana. After his tour, he returned to London and quickly signed a contract with the Rank organization, the venerable British production company, where he estimates he played "52 roles a year" in live televised plays. He also began a fledgling film career. By 1963, he had an impressive resume, including parts in "The Great Escape," "Robbery Under Arms" and "A Night to Remember," a role that led to voice-overs on Titanic documentaries and other suitably spooky material. It also led to "U.N.C.L.E." For the uninitiated, "The Man From U.N.C.L.E." was a stylish takeoff on James Bond that was broadcast on NBC from 1964 to 1968. The series starred Robert Vaughn as Napoleon Solo and McCallum as his partner, both agents at the United Network Command for Law and Enforcement who continually did battle with the evil forces of T.H.R.U.S.H. (the acronymically fantastic Technical Hierarchy for the Removal of Undesirables and the Subjugation of Humanity). There were also many gadgets and attractive guest stars. Solo wore a suit; Kuryakin, a black turtleneck. "I'd never heard of the word sidekick before," McCallum said, recalling the early days of the program. "The first episode I had about four lines and an accent." Despite lukewarm reviews, the show was a success with audiences; McCallum, meanwhile, managed to lend gravitas to lines like: "Almost. Almost is a word that sticks in the throat like failure." Coming hard on the heels of the British music invasion, McCallum's mod-dish head of blond hair and pale blue eyes struck a chord. "He's an intellectual Beatle," wrote one fan in a letter published in TV Guide. 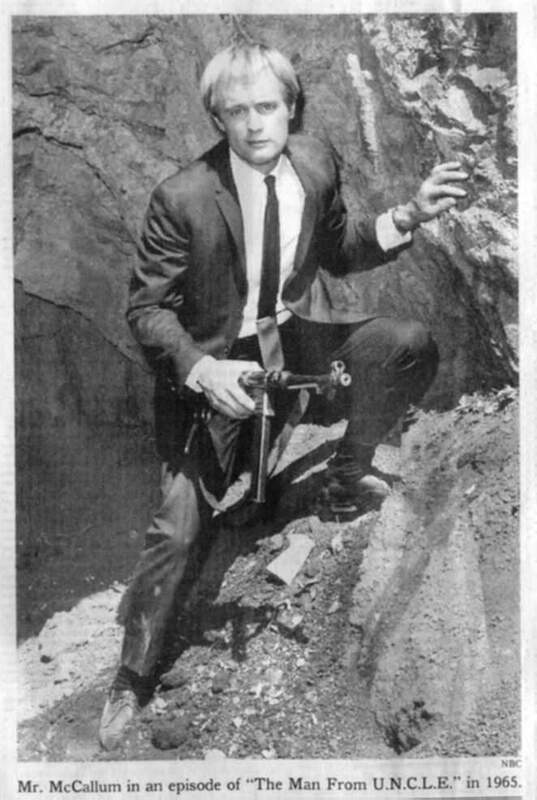 In 1965, at the peak of the show's popularity, McCallum was stampeded by 2,000 students at Louisiana State University and had to be evacuated by a phalanx of police officers. Another time, 15,000 fans screaming "We Want David!" tore apart two floors of Macy's clamoring for a look at McCallum. And TV Guide reported an alarming incident in Springfield, Ill., when 500 teen-age fans cheered McCallum's entrance as Judas in "The Greatest Story Ever Told," released in 1965. McCallum was stunned by the attention. "There was a cartoon around then with me in it, saying I was the greatest thing since peanut butter and jelly," he said. "Can you imagine higher praise?" The role earned McCallum two Emmy nominations, and he appeared in the six feature films based on the series. The show also led to one short-lived spinoff, "The Girl From U.N.C.L.E.," and too-many-to-remember requests for McCallum to play spies. "It was all Russian accents, gray suits and soft gray shoes," he said. By the time the show was canceled, McCallum was burned out. His nine-year marriage to the actress Jill Ireland ended in divorce in 1967, and a year later, with a new wife, Katherine, he moved to New York. "I figured I'd made enough of a spectacle of myself," he said. Slowly his life and career returned to normal with a string of steady if less glamorous acting assignments, voice-overs and television appearances. McCallum and his wife still live in Manhattan. They have two grown children. McCallum also had three children with Ms. Ireland; one, Jason, died of a drug overdose in 1989. His child's addiction was chronicled in a book by Ms. Ireland called "Life Lines," which was made into a television movie in 1991. "Some things are sent simply to test you," he said quietly. While he has worked steadily in regional theater, before this year he had not acted on stage in New York since 1988, when he appeared in Ibsen's "Ghosts" at the Roundabout Theater. For a long time, McCallum said, he didn't like talking about "U.N.C.L.E.," but he has relented. The show, too, has had something of a comeback since the cable network TNT began showing late, late night installments, or "Affairs," as they're known to devotees of the show. There's even talk of a feature film based on the series, directed by Quentin Tarantino. Though McCallum is stumped by Illya's continuing appeal, he finds the craft of acting less mysterious. "You get the part, you learn the lines and in the theater you listen to the other actors more than you talk," he said. "And then when you get onstage, you listen to the audience. Beyond that, I don't think there's really much else."